Who does not love having a pair of big, bright, and colorful eyes? And when it comes to great eyeshadows, Mac Paint Pots are a perfect choice. Being an eye makeup addict, I always wanted to try Mac Paint Pots but the high price of those beauties always stopped me. However, as soon as I got to know that Maybelline New York has launched exact Mac Paint Pot dupes as ‘Color Tattoo 24hr Eyeshadows’, I could not resist myself from buying one. 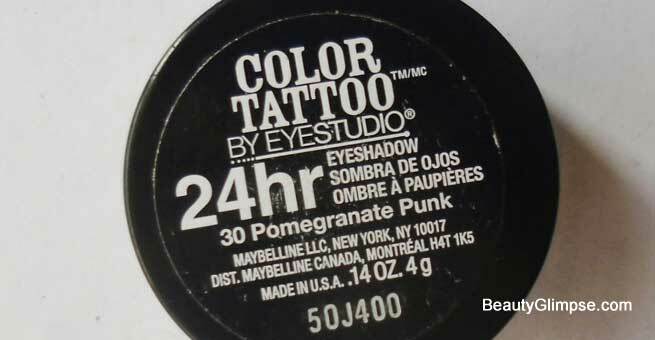 Today I’m going to review Maybelline Color Tattoo 24hr Eyeshadow (Pomegranate Punk). Let’s move to the review. Maybelline New York Color Tattoo 24hr Eyeshadow by EyeStudio is a long-lasting shadow eye makeup that gives an edgy dimension to your outfits. It is a waterproof cream-gel formula created by unique ink technology that smooths on the eyelids easily while its vibrant, super-saturated colors deliver 24-hour intensity paired with tattoo tenacity. Being an ophthalmologically-tested eye makeup, it is also suitable for sensitive eyes and contact lens wearers. Cyclopentasiloxane, Isododecane, Polypropylsilsesquioxane, Ceresin, Cyclohexasiloxane, Caprylyl Methicone, Synthetic Fluorphlogopite, Alumina, Silica Dimethyl Silylate, Disteardimonium Hectorite, Cyclomethicone, Propylene Carbonate, Candelilla Cera/Candelilla Wax/Cire De Candelilla, Caprylyl Glycol, C30-45 Alkyldimethylsilyl Polypropylsilsesquioxane, Calcium Sodium Borosilicate, Calcium Aluminum Borosilicate, Silica, Polyethylene Terephthalate, Tin Oxide, Acrylates Copolymer, Paraffin. Maybelline Color Tattoo 24hr Eyeshadow comes in a tiny glass pot with a black screw lid on the top. The packaging is transparent and the shade is visible from outside the pot. The jar is thick, sturdy, and travel-friendly too. I love the packaging a lot. It is damn cute and very similar to the Mac Paint Pots. Being a cream-gel formula, the texture of the eyeshadow is pretty creamy and it glides over the eyelids quite easily. I have tried using the eyeshadow with both a shadow brush and my fingers and I think that it is best applied with the fingers. However, I bought this eyeshadow 1.5 months ago and now the texture has dried a lot and thus, blending has become a little difficult. In short, the product hardens over time and it is definitely not expected from a brand like Maybelline. 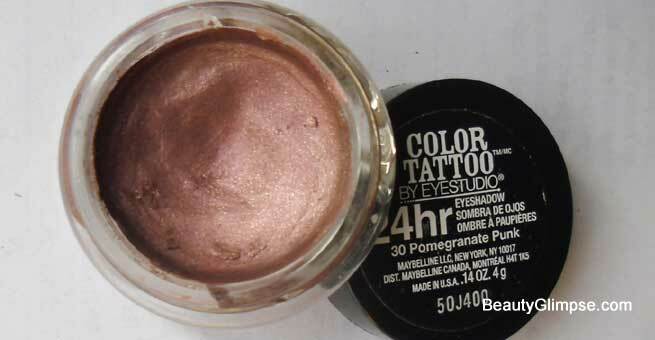 Maybelline Color Tattoo 24hr Eyeshadow by EyeStudio is available in a wide range of vibrant shades. Hence, there is absolutely no dearth of choice for eyeshadow lovers. The shade I’ll be reviewing today is the Shade No. 30, which is named as the ‘Pomegranate Punk’. 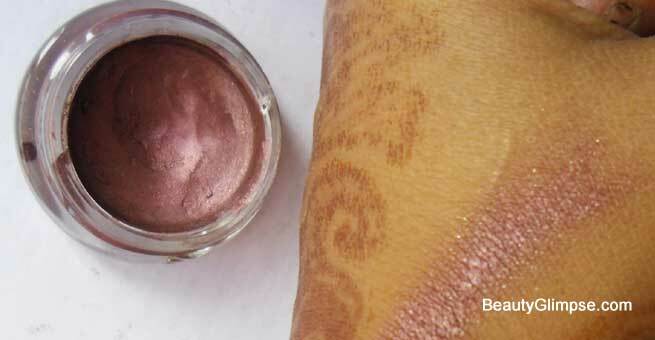 The shade is a mixture of copper and burgundy with a hint of golden shimmer in it. It is very pretty and gorgeous, which is apt for the marriage season. Though it has shimmers, they are not very chunky. So, you can also wear it during the day for a subtle glam look. It is a highly pigmented shade and you do not need to apply it multiple times. Just a single swipe is enough to get an intense coppery-burgundy shade on your eyelids. You can use it both as a shadow and a base. The staying power of the Maybelline Color Tattoo Pomegranate Punk is awesome! Though it claims to stay for 24 hours, I’ve tried it for maximum 6-7 hours (after all, who wears makeup for 24 hours?!). It, indeed, came out as a winner. In fact, it stays intact on my eyelids until I remove it with an eye makeup remover. The most interesting thing about this product is that it is smudge-proof and waterproof. It lasts long and that too without creasing at all! Overall, I am very happy with the shade, its finish, and its staying power. The only disappointment is the drying texture. However, I’m overlooking it because of the affordable price tag. Using fingertips, apply eye shadow from the inner corner of your eyes and work outwards. For added drama, reapply to darken. The Maybelline Color Tattoo 24hr Eyeshadow by EyeStudio is one of the most affordable professional range eyeshadows available in India. It is available in a lot of shades that suit Indian skin tones perfectly. It is long lasting, smudge-proof, waterproof, and highly pigmented. The only issue is its texture that dries up and hardens over time due to which the blending becomes a little difficult. But I’m still in love with it and going to purchase other shades. It is highly recommended to everyone. Mansi Chauhan is an engineering student. She is passionate about makeup and loves purchasing loads of beauty products. Besides writing & reviewing beauty products, she loves photography & reading novels.